If you've been following my blog for a little while then you'll know that I'm a big fan of lip crayons, all the ones I've tried though have been glossy so when all 8 shades of the new I Heart Makeup (sister brand to Makeup Revolution) WOW Sticks came through my letterbox you can imagine my excitement. These aren't like other lip crayons that I've tried, they have a matte finish, all the other ones I own from other brands have a glossy finish. I've been trying these out for a few weeks now so I think it's about time I told you what I think of them! 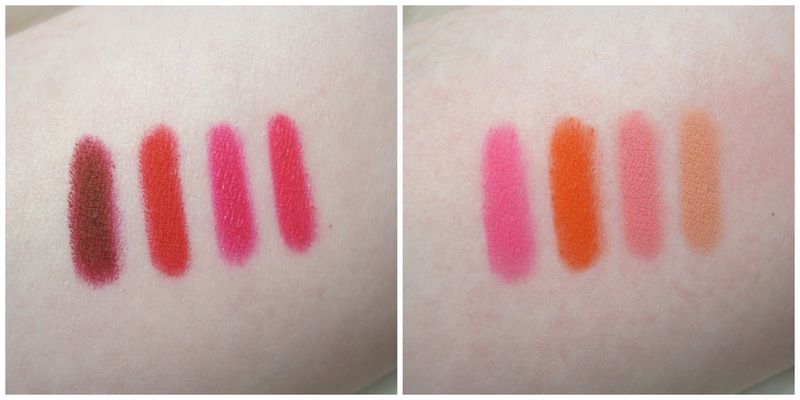 These new WOW Sticks from Makeup Revolution's Sister brand I Heart Makeup have a super intense cream matte finish and they really are intense and full of colour. I was kindly sent all 8 shades and I'm impressed by how many shades are available, there is definitely a colour for everyone. I wasn't able to take pictures of all the shades on my lips before I had my operation but this definitely gives you a general idea of just how pigmented these products are. I have to start off with the packaging, a bit of a negative point, the shade names are only on the boxes which is slightly annoying. I don't usually keep the boxes that products come in but I don't have a choice this time and I'm so worried that I'll put them back in the wrong boxes! On to the positives though and as you can already see they are super pigmented and bold, these definitely aren't for those who like a subtle dash of colour. My favourite shades are Sunday Girl and Call Me, I was really surprised that I liked Call Me so much as I usually shy away from reds. I find that the darker shades are a lot easier to apply and generally look better on the lips, the lighter shades do look a little patchy. Despite these being so matte they do go on quite creamy and then dry to this finish, you could easily put a gloss or balm on top if you wanted to though. Makeup Revolution claim that these are waterproof and they really are, they just don't budge and they don't smudge or wear off easily! These ain't perfect but at only £2.99 I think they are definitely worth looking at if you like a bold matte lip colour. I think I'll be wearing Call Me and Sunday Girl a lot this Autumn/Winter! I have these, they are so so lovely but I'm not sure if I love the matte finish. I know some people adore it but I'm still on the edge!! I hate when the name of the colour isn't on the product but I love these colours! I'm not sure about Matte finishes but I do like the shade Dreaming so I might have to have a sneaky look at these. Love the shades! They look pretty pigmented too!